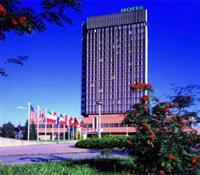 Hotel Gomel is an elegant high-rise building, located in the town of Eeske Budejovice. It is within five minutes walking distance from the Old Town and the city's main square. This hotel offers many services and it is an ideal place for different meetings, firm actions or private actions. In front of the hotel there is a large car park, which the clients can use. Hotel Gomel offers 204 rooms. All the rooms are equipped with bathrooms (WC) hair dryers, SAT-TV, direct dial telephones with the option of Internet access and mini bars. On the 16th floor there are placed 11 rooms of category Superior with air-condition, and three of them have modification for disabled guests. At the reception hotel offers the clients other services - an exchange office, information service, hotel taxi service, gift shop and a hairdresser. American Express, Eurocard / Mastercard, Visa, Diners Club a CCS Business credit are accepted in the hotel.